We have 416 levels answers organized in 0 categories for this game. Welcome to the guide page for 4 Pics 1 Word Daily Answers. Highlighted below on this page you may find the answer to the puzzle of December 31, 2018. For answers to all the levels published on our site go to the main page 4 Pics 1 Word Daily Answers, where we upload the answer for the latest puzzles every day. 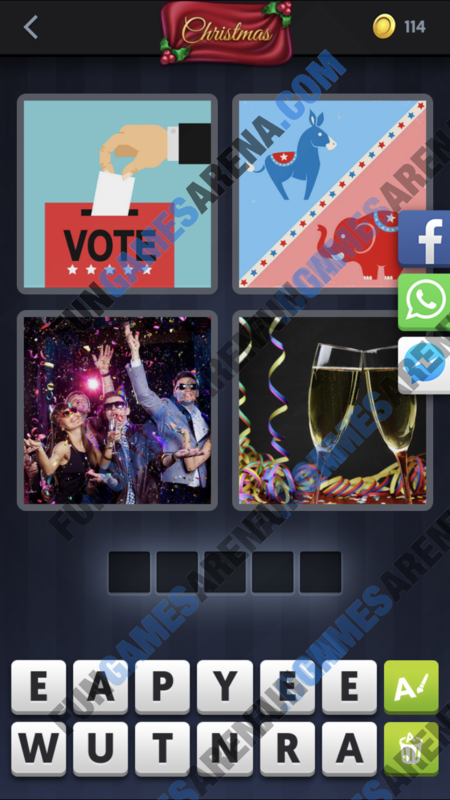 4 Pics 1 Word is probably the most famous and most successful guess the word game of all times. It has received great feedback from millions of players around the world and is played by around 220 million people! You are presented with 4 pictures that illustrate a word, and to solve the level you must type the correct answer based on the letters shown. Even though the concept of the game is very easy, some levels will be fairly hard to guess. If you get stuck looking for the answer to a level visit our guide page 4 Pics 1 Word Answers, which is updated regularly with the answers to the daily puzzle.